Earthbag home construction is an ecofriendly technique that involves filling sacks or bags with various inorganic materials. Earthbags have the advantage of providing either thermal mass or insulation, depending on what the bags are filled with. When filled with soil, they provide thermal mass, but when filled with lighter weight materials, such as crushed volcanic stone, perlite, vermiculite, or rice hulls, they provide insulation. Once the bags are filled, walls are gradually built by layering the bags in a staggered pattern similar to bricklaying. It is likely that construction of an earthbag home uses the least energy of any durable construction method. Unlike concrete, brick or wood, no energy is needed to produce the necessary materials other than gathering them. With on-site soil being used, practically no energy is expended on transportation. The energy-intensive materials that are used — plastic, steel wire and perhaps the outer shell of plaster or stucco — are used in relatively small quantities compared to other types of construction. Depending on how they are designed, earthbag homes can be made to resemble hobbit homes, if that aesthetic appeals to you. 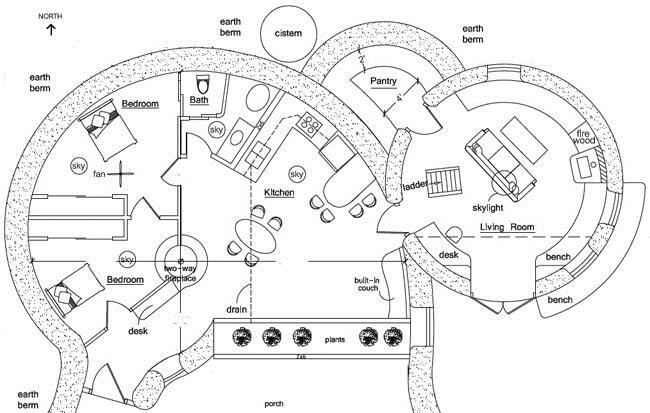 Earthbag home plans vary in size, shape, and type, allowing you to choose the right earthbag home construction for you. While some like to down size, large earthbag homes are available for those who want a little more space. Contacting a professional with experience in this particular type of building is essential. BE Structural has experience designing and building earthbag homes, as well as designing earthbag structures that resemble hobbit homes in particular. If you are interested in living off the grid and building an earthbag or hobbit home in Texas, Pennsylvania, Michigan, or Colorado, fill out the form to the right to start a conversation about your unique needs. You can also call us at 1 (866) 682-2693 or email info@bestructural.com. Below is a drawing of a modern earthbag home designed by Owen Geiger, in which the walls were constructed out of earthbags. Distinguishing features include two bedrooms, masonry two-way fireplace, covered porch and cool pantry for storage of food (no electricity required for refrigeration). This home meets zero energy standards. 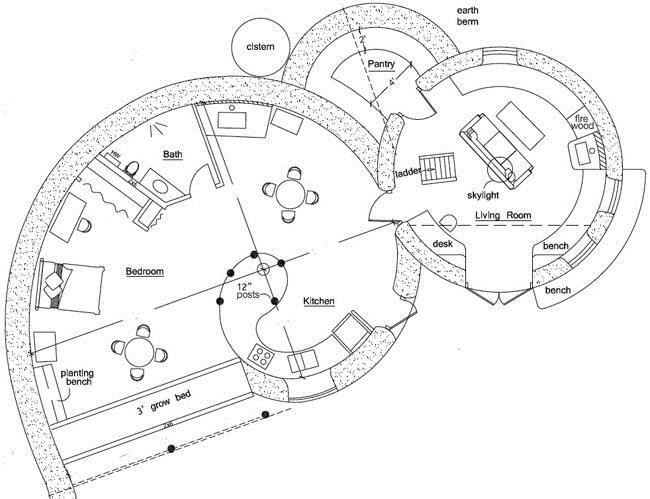 The following are two example floor plan possibilities for the spiral dome design pictured in the drawing above.